In what Capcom’s effectively declared The Year Of The Beat-‘Em-Up, it’s little surprise that every other major fighter wants a piece of the action. Even those that haven’t made or readied a 2009 release find themselves subbed out for new franchises, the likes of Blaz Blue and Battle Fantasia stepping in for an injured Guilty Gear. And you can argue that this simply wouldn’t have happened if it hadn’t been for Street Fighter IV reinvigorating the genre and shepherding the forgotten fans back into the land of the stick. 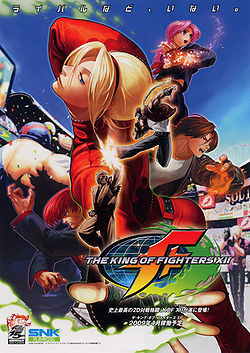 One series that would still be marching on regardless of Capcom’s activity, however, is SNK’s popular King Of Fighters brand, here given its first proper makeover since the ill-fated Maximum Impact and all the better for it. Along with this lush new presentation, which isn’t nearly done justice by static imagery, comes a series of equally hefty alterations elsewhere. Up scaled visuals lead to a greatly downscaled roster, with just 22 characters available in our early build and some popular faces such as Mai and K’ sadly missing. And those who do return may not be quite as you remember them: move lists have been altered in as seismic a shift as the visual changes, leaving some characters almost entirely different from how they’ve been for years. System changes, too, rock the proverbial boat, a Focus Attack/Dust-style heavy blow offering crumple, counter and cancel options depending on your usage. And elsewhere, the Critical Counter mechanic sees a rage gauge atop the screen fill as you take damage, filling up to initiate a brief window where a strong counter hit grants you a custom combo opportunity. This slows fights down once either player’s meter starts blinking, a more considered approach meaning you’re less likely to eat the heavy counter that would invariably lead to another 20-odd hits. This ocean of changes will likely leave a lot of KOF fans somewhat out of their depth as the series sails off in a bold new direction. New elements change the pace and timing while massive character dota 2 hero guide alterations will lead players away from fighters they’ve backed for ages. It’s odd to see such a shift when Street Fighter has done the polar opposite, embracing and building on its core values and mechanics. SNK’s latest instead ventures way out of its comfort zone. Even the slick visual style has met with mixed reactions from fans, some infatuated with the hand-drawn look, others unable to see beyond the decidedly old-school outfits worn by the cast. It’s not hard to see why X// has been branded The King Of Fighters Re-Birth – we just hope fans can accept and appreciate the, least traditional KOF game in years.